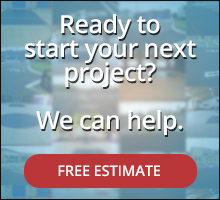 What to know about Outdoor Basketball Court Painting | Brite Line Paint Co. Inc.
A basketball court has to be lined properly in order to ensure the game is played properly. Any issue with the lining of the court could cause problems during play. Basically, accuracy is everything and the paint needs to be easily seen on the surface. When dealing with outdoor courts, there are normally two surfaces that are worked with. They are the asphalt basketball court and the concrete basketball court. Both surfaces require specific processes when preparing them and actually resurfacing and painting them so that they are once again safe and usable. Sometimes basketball court resurfacing is needed before any painting takes place. Older courts most likely have cracks and chips in them. The surface could also be crumbling in some places, which can present a hazard. Sometimes what is needed are repairs and other times the entire surface may need to be replaced with asphalt or concrete. Whatever the need, it can be done. Nonetheless, you can count on basketball court resurfacing taking place before the surface is ever replaced. This is a good way to make the surface pay for itself again and again throughout the years – you get the most life out of it as possible. Once an existing asphalt paid is repaired and sealed, the necessary wait time has to occur before it is painted. If a new asphalt pad had to be laid, it takes approximately two to four weeks for the asphalt to cure. Basically, you are waiting on the asphalt to completely harden and for the oils to come out of it. If a sports court painting company tried to do asphalt basketball court painting before this period is up, then the paint may not take well due to the oils coming out of the surface. An acrylic resurfacing paint can then be applied by hand with a rubber squeegee so that the pores in the asphalt are smoothed out. This is what gives the court the smooth finish like a tennis court in many cases. If the court is a traditional asphalt court, then two coats of the resurfacing paint will be needed to give it a smoother feel. Once the resurfacing coat is down, color can be applied. Two coats tend to do the job. After this coat is dried, then the lines can be applied with a professional taping machine. Just like asphalt, a concrete pad may already exist or a new one needs to be laid. If a new one has to be laid, then it takes two to four weeks for the concrete to cure. When a new one is constructed, it is important for a brush finish to be used. This is very important because the court’s surface has to have texture so the paint has something to hold on to. If it is a smooth finish, then the paint could peel or chip. Nonetheless, the first step before concrete basketball court painting is to clean the surface so that alkaline can be removed from the surface. An adhesion promoter may also be added so that the first coat of paint is able to adhere properly. One to two coats of an acrylic resurfacing paint is then applied by hand with a rubber squeegee. Not as much paint is needed on a concrete court as an asphalt court because concrete is not nearly as porous. But even with less paint needing to be used, four coats of paint should be applied. After this, the color can be applied. Once this phase is complete, the lines can be applied using the professional tapping machine. 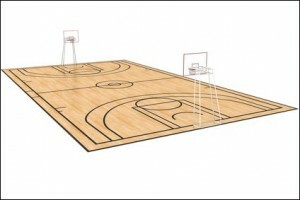 When you engage a sports court painting company to redo your outdoor basketball court, there are many options that are made available to you. Those options include different colors to choose from, as well as certain designs that can be applied. If the court is an outdoor court belonging to an organization, you can have the organization colors applied along with any logos. It is best to consult with the company to see what your options are and combine your ideas with their creativity to have a basketball court that looks fantastic. If you have an outdoor basketball court needing painted, Brite Line Paint Co. can help you. Call us at 508-678-6775 or fill out our contact form.